Bates is about 9,600 miles from his hometown of Surakarta, Java, but the gamelan musician and master puppeteer Darsono has found that the college was surprisingly well-prepared for his residency this academic year. Boasting a longstanding Indonesian performance arts program that’s equipped with two sets of the melodic percussion instruments known as gamelan — not to mention an extensive collection of shadow puppets, around 250 of them — Bates has much more to work with than many colleges, says Darsono (who, like many Indonesians, uses only one name). So what we have here is an instance of value meeting value. Heir to an esteemed family tradition of music and puppetry in the Central Javanese city of Surakarta, Darsono is one of the most prominent musicians from a region that’s a major hub for performing arts. “He is one of the most highly ranked musicians of his generation,” says Associate Professor of Music Gina Fatone, director of Bates’ gamelan program. A Connecticut resident currently teaching at Tufts, Smith, and Yale as well as Bates, Darsono has also taught and performed in the Netherlands, Japan, and Singapore. Since he arrived at Bates last fall, he has spent four or five days per month at the college — a typical schedule for artists-in-residence in music here. 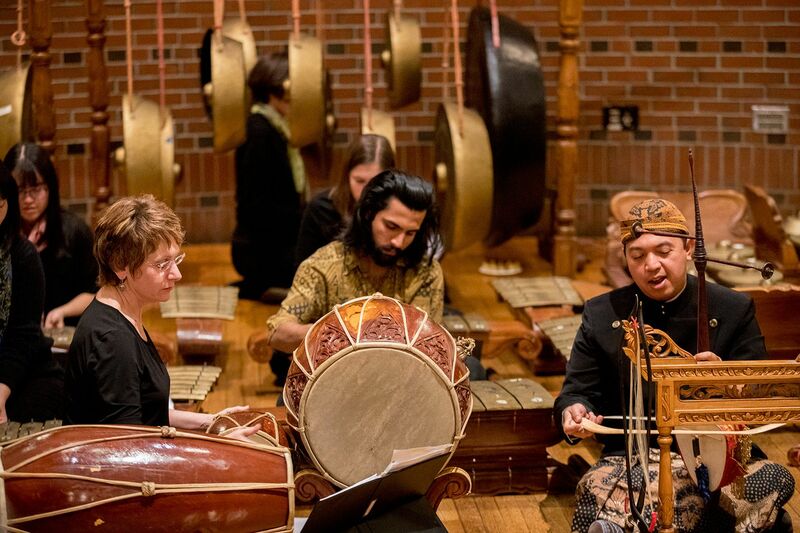 He has lectured in music and Asian studies classes and has worked with the Bates Gamelan Orchestra, prepping the ensemble for performances that include upcoming gigs on April 4 and May 18. On the latter date, after two weeks of daily rehearsal in the context of the Short Term unit “Performing Musical Art of Indonesia,” Darsono will direct and perform a Javanese “shadow play” with musical support from the gamelan orchestra. 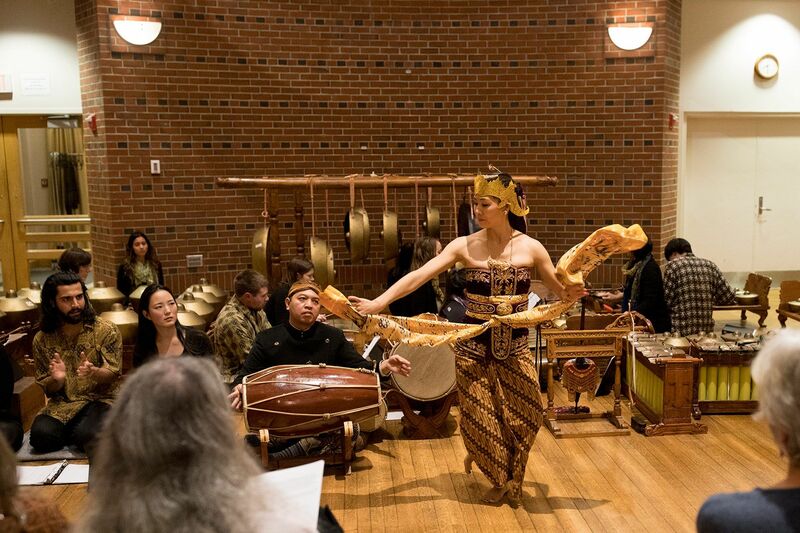 In addition, through the course “Visiting Artist in Music Ensemble,” Darsono has coached individual students in Javanese gamelan and puppetry. 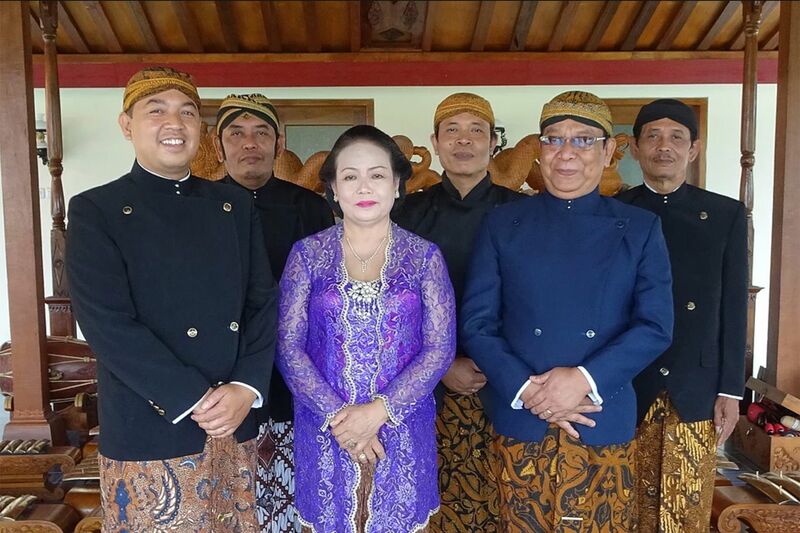 Darsono (left front) brings his chamber ensemble Ngudi Raras to Bates on April 4. Kinsey Moser, a senior from Burke, Va., who has played with the Bates gamelan for almost three years, is one of those students. “He never seems to get frustrated even if we are struggling with a simple pattern or rhythm,” she says. 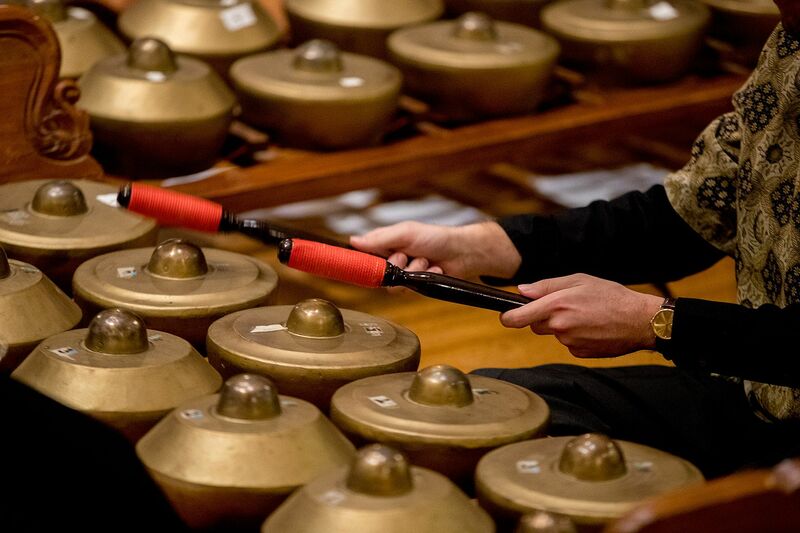 “One particular instance when his teaching really made a difference for me was when I was learning a particularly difficult part on the ‘bonang panerus’” — a sort of xylophone that uses tuned gongs instead of bars — “and I was unable to play it. 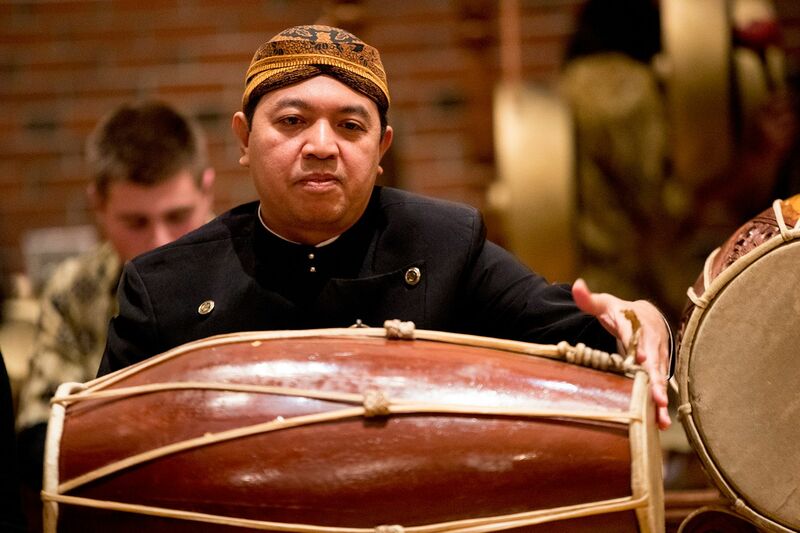 The April 4 program will include a substantial set by Ngudi Raras, a six-member gamelan chamber ensemble that features Darsono and is currently on a U.S. tour. “For the small group, we just meet and play together without arranging it before,” Darsono says. “Everything is spontaneous” — but making it work requires close attention to the other players and a profound knowledge of the musical vocabulary. It’s like jazz in that regard. But that resemblance may be as close to Western music as traditional gamelan gets. Much about the genre — musical structures, cultural uses, performance practice, instrumentation — sets it apart from music familiar to Americans. Bates’ gamelan program is a sui generis expression of the college’s mission-driven embrace of the transformative power of human differences. “I think for students it’s very important to have experience with a different culture than you’ve had before,” Darsono says. “It’s great for you [to learn] how to respect, how to work together with somebody that you didn’t know before.